CureIt! é um GRÁTIS anti vírus e anti scanner de spyware fundou no Dr.
CureIt! is a FREE anti virus and anti spyware scanner based on the Dr.Web best of breed engine with the most up-to-date add-ons to the Dr.Web virus bases. As hundreds new viruses appear and spread in hours around the world daily, CureIt! with the newest definitions to the virus bases is re-built several times every day. CureIt! 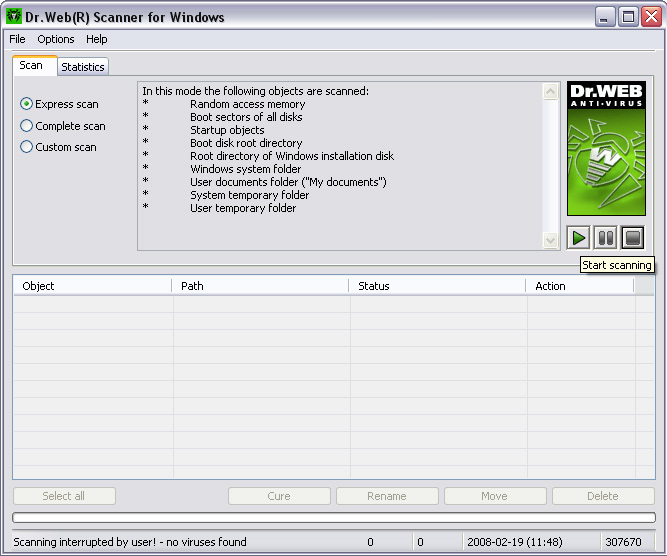 will help you quickly scan and cure, if necessary, a computer operated by MS Windows 95OSR2/98/98SE/Me/NT4/2000/XP/2003/2003R2/Vista without installation of the Dr.Web Anti-virus. The utility supports 28 languages: Russian, Arabic, Armenian, Bulgarian, Byelorussian, Chinese (China), Czech, Dutch, English, Esperanto, Estonian, Finnish, French, Georgian, German, Greek, Hungarian, Italian, Japanese, Korean, Latvian, Lithuanian, Persian (Farsi), Polish, Portuguese, Slovak, Spanish, Ukrainian. Dr.
Antivírus gratuito para uso pessoal, muito eficiente, com atualizações diárias via internet. 100% proteção contra qualquer ameaça por campanha de USB e protege computador offline. Os mundos a maioria software antivirus popular escolhido por mais de 100 milhão usuários. Descobre e automaticamente remove malware sem a necessidade para usar modo SEGURO. Ferramenta de remoção descobre e extermina muitas worms, trojans e backdoors. remove Seqüestradores, Adwares, vírus, Spyware, Madeireiros Fundamentais, Troiano, Marcador. GeSWall assegura uso seguro das aplicações de internet de um modo suave!